So i got a bunch of new stuff lately and one thing that I have is a movie called "A Day in The life". The movie is by Kirk "Sticky Fingaz" Jones of Onyx and first looking at a movie by a rapper with that bland title and an idea of what straight to video stuff normally results in I wasn't thinking ti was going to be worth more than some good laughs. i was mistaken. While the movie doesn't attempt to have an original story for the most part, it is a drug tale point blank. It is told entirely through rap, sort of like Carmen on MTV from a while back, but better. That's right, Sticky and his cohorts have crafted a movie that makes sense, uses all rap lyrics, with pretty good beats and a good cast which includes Mekhi Phifer, Omar Epps, Michael Rappaport, and Bokeem Woodbine. Also in the movie is newcomer Melinda Santiago. Basically the movie doesn't have a huge plot twist however it does have enough action and turns to keep you attentive. I don't want to get into details you can check it for yourself and I highly suggest that you do. 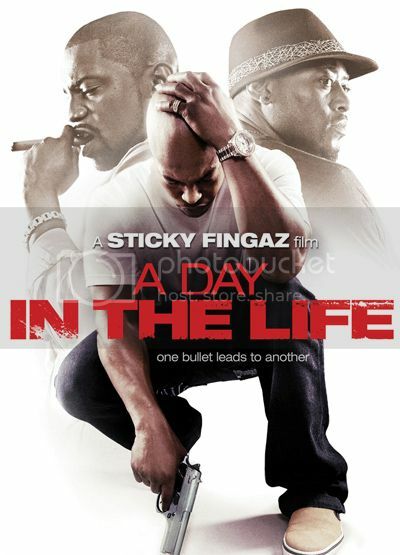 I NEVEVER KNEW STICKS DID A FILM " A DAY IN THE LIFE " I CAME ACROOSS IT IN iTUNES I REALY ENJOYED THE MOVIE. TO MY CUZ X1 WHO DID HIS PART IN DA MOVIE R.I.P. Has R and B become a one trick Pony? Jay-z is full of you know what. Best of Both Worlds - Can it work again?